I don't like spending my time working through endless admin - I prefer to be out playing music. That's why I setup the DJ Admin management system to allow me to automate a lot of the admin and free up my time. The DJ Admin management system is designed to help DJs and their clients manage any event - including mobile discos and wedding receptions. As A DJ myself I understand what you and your clients need to make the system work for you both. The system provides DJs with a tool to manage their bookings, reducing the time spent on admin to allow you to focus on DJing. It offers your clients with a space to plan their function, including requesting the music that they and their guests want to hear during the event. It is designed to be as easy to use as possible, for both you and your clients. The system keeps track of your events, including staff management, accounts and an online music request system for your clients (and their guests) to use. It is hosted on my servers but designed to integrate with your website, matching the look and feel. Depending on your website hosting service, I can even make it appear as if it were your website by using a subdomain, for example planner.yourdomain.com. 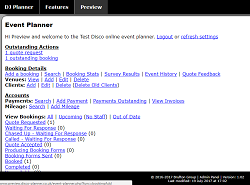 Find out more about the features of the DJ Admin management system. I have designed the DJ Admin system to be effective and as low cost as possible; at either £10 per month or a reduced rate of £100 per year if paid annually. Payments can be made via bank transfer or via PayPal. There are no different packages to choose from; the only choice is whether to pay monthly or annually. So you get all of the features listed and don't need to worry that you're missing out on something. I have applied a common sense approach to the pricing structure and reserve the right to increase the charges for large scale operators, afterall if you're sending out 100s of DJs a night it's only fair that you pay more to use a system with so many DJs registered. I don't believe in hidden charges; there are no setup fees and no exit fees. If you decide to leave at any point you will have the option to export the information on the database into a CSV file (comma separated file) to allow you to import it into applications such as Microsoft Excel. Current SEDA members receive a 25% discount on both the monthly and annual fee. If you have any questions you can contact me. 02/04/2019: We've been busy working on several updates behind the scenes including improvements to the email templates and more options to automate more processes to reduce the time you spend on admin. 16/11/2018: The preview section has been updated to the latest version - v2.00 - which includes a fresh layout and several new functions including the ability to customise your email templates. 21/09/2018: Several new functions are being added to the latest version - due to be launched in the coming weeks - including Google Maps integration and a lot of updates to the coding behind to scenes to improve the experience for everyone. Any planned maintenance will be communicated in advance and is usually carried out overnight to minimise any disruption.